or use the map below to determine the best route from your location. 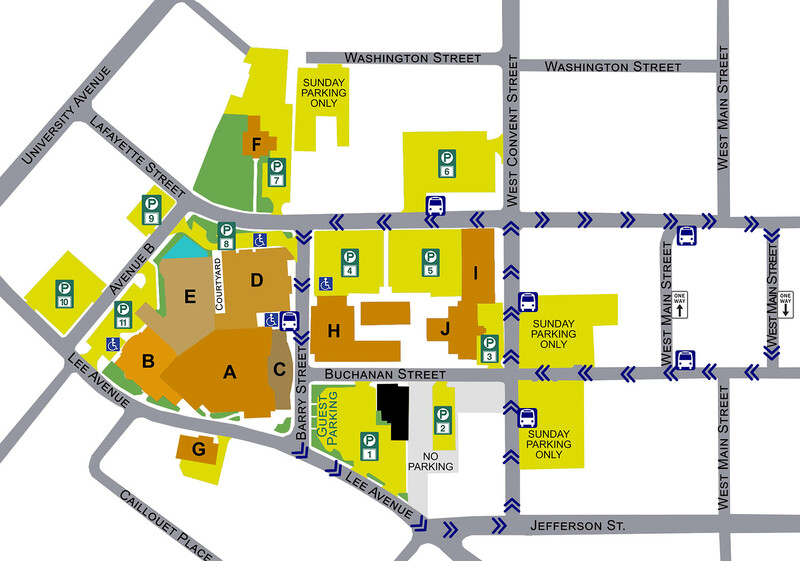 Below is a campus map with our parking lots and shuttle route. First Baptist has 11 parking lots, and for those who are parked a little farther away, we offer Shuttle Service on Sunday mornings. The shuttles operate from 7:15 a.m. - 12:15 p.m. Look for Shuttle Stop signs along the route. In addition, golf carts operate in closer parking lots for those who prefer to ride. Guest Parking is in Lot #1 just across the street from Barry St. Entrance A. An Information Center is located just inside that entrance. Handicapped Parking is available in lots #4, #8, and #11. Metered on-street parking is always free on the weekends. A temporary orange cover over a meter also means that no payment is required. We do encourage you to park in a legal parking space if parking on the street.